Public domain books are available for free from Google eBookstore. You can download and read them on a NOOK Tablet. You can continue reading the same book on your iPhone as you commute to work or read some more on the computer at your desk. 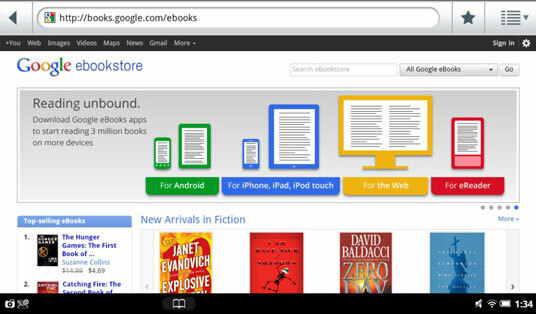 As with the NOOK store, the books from Google eBookstore are tied to your account — not to a specific piece or brand. Save it to your personal computer. Connect your NOOK Tablet to the computer using the USB cable. Make sure the cable came with your NOOK Tablet. Load the file from the computer to the tablet. If you haven’t already, install the latest version of Adobe Digital Editions on your laptop or personal computer. Enter an Adobe ID if prompted. If you don’t have an Adobe ID, you’ll see a link on-screen to get one. From that point, anytime you buy an item online with a service (like Google eBookstore) that requires Adobe Digital Editions, the item is automatically associated with your Adobe ID, rather than your computer.